On the boat, we try to live by the multi-use rule: everything should have at least two uses if it’s going to take up storage space. For years, I’ve been making “green cleaning solutions” that include vinegar (forget buying all the expensive cleaning solutions in the stores!). It is probably one of the best things I’ve found for cleaning grease and grime off our stoves and it makes our chrome sink fixtures shine (both boat and home). Here on the boat, we pour vinegar in our head on occasion to help keep the hose to our holding tank clear. And, of course, we use as a marinade (with salt) for grilled chicken and in salad dressings. However, I had no idea how great it was for bug bites! No-see-ums don’t care a whit for Ron (he claims it’s because of his vitamin B –beer–intake), but they LOVE me. 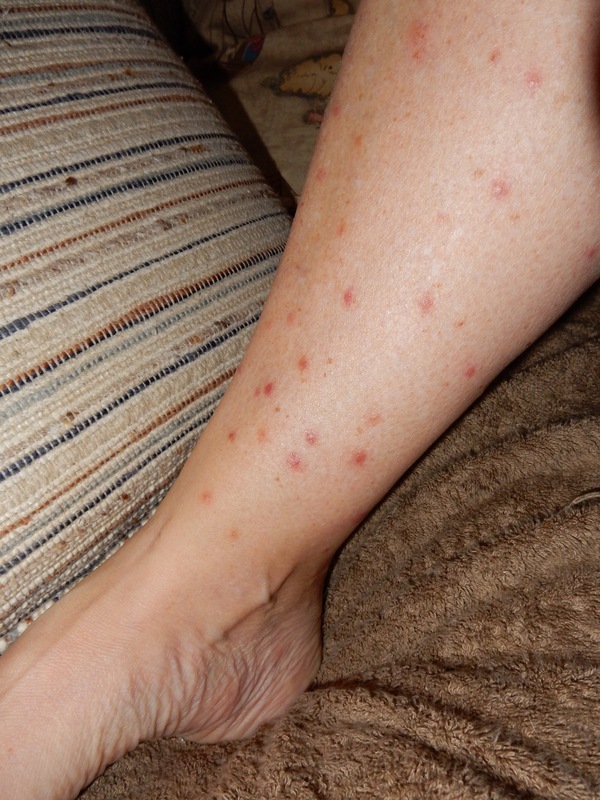 Unlike mosquitoes, no-see-ums’ bites aren’t that noticeable–little needle-like pricks–and if I’m busy talking with someone or doing something, I really don’t take much notice of them… until a couple days later when I’m itching, welts are rising, and my skin is burning. After a couple of days working in the boatyard (with sun and temperatures in the mid-80’s–I apologize to my friends in the deep freeze back home), I changed out of shorts and put on some light crop pants, just so that my legs were more covered. However, they still managed to chomp up my lower legs big-time. A few evenings ago, following a shower and with my legs burning and itching, one of our friends here mentioned that vinegar helped give relief from the itching. This was after several nights taking benedryl to help me sleep at least a few hours without scratching, and many days covering much of my body in hydrocortisone creme and topical benedryl lotion. The woman I was with began dabbing herself with bits of her wine, the closest vinegar-type solution she had. When I returned to the boat, I immediately poured a bit of white vinegar in a glass and began dabbing the bites on my legs: immediate relief! I continued with the bites on my arms, my neck, and my chest. I may climb into bed smelling like pickles or a salad, but the vinegar works as well, if not better, than any expensive topical anti-itch creme I’ve used! My bites are beginning to fade and hardly itch at all today. Unfortunately (? ), the forecast is for warmer temperatures by Sunday and my jeans will be too warm for working. Obviously, we need to get our keel fixed and get out of the boatyard! I have adopted the vinegar – seems to work with a lot less mess- thanks for the suggestion last week. And thank you again for helping to shuffle the car. Hope your repairs are going well.